So- your new home or office space has been remodeled and is all ready to move into – except for the construction debris and film of building dust that is coating the walls. Don't worry - CLA Commercial Cleaning can help you to take care of that! We have tremendous history of experience getting rid of construction clean-up in New York and the Tri-State areas. Our teams of professional cleaners will quickly get to work to remove all traces of cement, wood shavings, dry wall, paint, masking tape, sawdust and other types of building materials. We will leave your new residence or commercial/office/business space bright, polished and shining, and completely ready to move into. Carry out any other cleaning work necessary to leave your premises ready to move into. CLA Commercial Cleaning has worked on construction clean-up with numerous contractors throughout New York city and Tri-State area. Property and Office managers alike have relied on us to leave their office looking, feeling, smelling fresh \ and a pleasure to move into. We can also help you with post-construction cleanup and regular office maintenance and cleaning services once you become established. 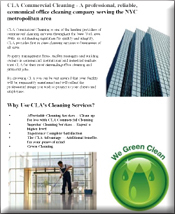 For more information and a FREE estimate, please call CLA Commercial Cleaning at 646-532-3748 our contact us line. CLA Commercial Cleaning – we will keep your premises looking its best day-in, day-out throughout the year. Our other services include office and business cleaning, carpet cleaning, floor waxing and finishing companies, window cleaning, janitorial and porter service companies.